Do you peel or pick off your scabs over and over and not let them heal? Do you have sores for months at a time that don’t heal because you cannot leave them alone? Maybe you feel like you don’t have any willpower. What you do have is this “need” to make it smooth. Sometimes you may be thinking rationally – perhaps it’s an acne scab on your face and you feel like you need a smooth surface to hide it with makeup. Other times, there’s no rhyme or reason other than it feels like an absolute need for you. Where did this need, or compulsion, come from? It’s a natural tendency for us to want our skin to be smooth, and to reduce any irregularity. It’s a grooming behavior that, in its moderate form, has been selected for through evolution. But sometimes, for some of us, we become addicted. Perhaps your love of scratching off and picking scabs comes from childhood experience. Maybe you had loads of mosquito bites or the chicken pox, and you discovered that scratching and picking them gave you some relief from the discomfort. Your body then learned very well, and repetitively, that it helps to “scratch an itch”. Not everyone who has these experiences ends up compulsively picking at scabs as an adult, but a fair number of us keep doing it, and get sensitized and focused in on perfection in our skin to the point where any little scab or skin irregularity gets scratched, picked or peeled. These behaviors give a temporary satisfaction that is the “reward” for the behavior. Habits and addictions always have the promise of a possible and perhaps immediate reward like this, which is why they develop. Unfortunately, it doesn’t matter what unfortunate or even devastating consequences come along with the reward and after the reward. We can’t help ourselves. It becomes a vicious cycle that is very hard to get out of. I think of picking scabs and other skin picking type behaviors as a behavioral addiction. Clinically it is classified in the American Psychiatric Association diagnostic manual (DSM-5) as excoriation (skin picking) disorder, and frequently requires professional help, depending on the severity of the picking. Help for Scab Picking – How can you change? Although many people find they need to work with a professional because of the complexities of the disorder and the daunting nature of recovery from it, many others can help themselves. Here are some self-help ideas. Prevent a wound from forming a scab in the first place by taking care of it properly. The American Academy of Dermatology says that scabs form when wounds dry out. So don’t leave it out in the air. The Academy advises washing the wound with mild soap and water and using petroleum jelly to keep it moist, then covering it with an adhesive bandage. Taking care of a wound properly in this way will also minimize scarring. No antibiotic ointment is necessary if the wound is clean. Additionally, picking a scab covered in Vaseline likely doesn’t have the same appeal for you, and so this is an excellent strategy in itself for avoiding picking the scab. Plus you’re keeping it covered, so you can’t touch it even if you want to. Blocking yourself from picking in this way is an important strategy in helping you recover from compulsive picking. 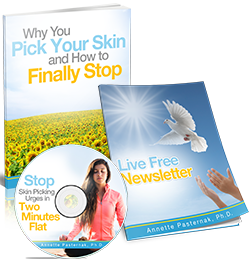 Using this strategy consistently over a long period of time can go a long way to reduce the urges to pick, not to mention allowing your skin to heal. If you have a lot of picking “hotspots” in one region, you may want to use these Tegaderm bandages, which you can leave on for days at a time. If you do get scabs, they can drive you crazy simply because they itch. In that case it can really help to give your skin an additional sensory input by applying ice. You’ll find the itchiness goes away quickly. Another technique to use for reducing itchiness, as well as picking urges, is a calming breathing exercise with a breath hold. Sign up for the free Freedom Kit and one of the free gifts you get is a video showing you how to use this easy and fast strategy. According to Charles Duhigg, the author of the excellent book, “The Power of Habit”, the key to succeeding at habit change (even for addictions) is to find a replacement behavior that is satisfying – it gives you a similar reward to the one you get from your damaging behavior, but it is not harmful itself. You then need to know when to do it – recognize the times / places / activities / emotions that typically trigger or cue off your picking. If you do the replacement behavior instead of picking your scabs, you may find that it takes the edge off enough that your urge to pick will be much less, and you’ll be able to successfully avoid picking. Identify what the reward comes from. Is it the sight of peeling the scab? Is it the feeling in your hands? The sound? You’ll need a replacement that gives you a similar reward. I know it’s never going to be exactly as good. There is no such thing as a perfect replacement. We’re just looking for “good enough”. If you like the sight of picking scabs, you might get similar satisfaction from watching a video of someone else doing it. If you like the feeling of picking scabs you might like this replacement behavior, which requires a little preparation. 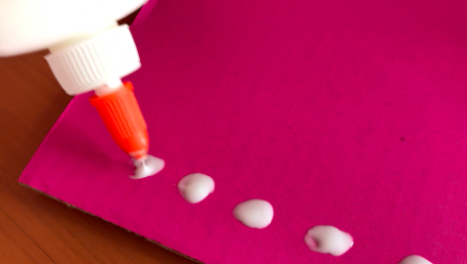 Put small lumps of glue on cardboard. Then after it’s fully dry, you can pick them off. Watch my video below. Those pastel “smarties” dot candies that you peel off the paper are similarly engaging. But don’t eat them! Sugar greatly increases picking in most people. On the other hand, it might be the other side of things, the skin that’s being picked at that is giving you the rewarding feeling. In that case, gently brushing the area with a dry brush, or digging your fingernails into the area without actually picking might give you enough of a good sensation to replace the unwanted picking behavior. Again, ice can be helpful as a replacement behavior. If you think you may have a skin infection, make sure you seek medical care promptly. 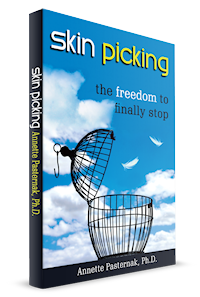 A compulsive skin picking disorder can be complex and very difficult to recover from. I take you step-by-step through it with my acclaimed book, online course or coaching. I’d love to hear from you – please contact me to learn more about how my individual and group coaching services can help you.